Another day, another day of attempting to eat just pies this British Pie Week! The Pierateers ate 15 pies on Day One and another 13 and a half on Day Two! Grab a pie, make a pie, tweet your #PiePledge. As for the Pierateers, Pierateers RAS and SJL are competing in the #Pieathon challenge where they both see how long they can last eating only pie! Pierateer RAS will be also be attempting the 50:50 pie challenge over the whole week! Pierateer RAS had the morning off on day three of British Pie Week, in part to catch up on some pie reviews! You could tell on day three of his #Pieathon challenge, seeing how long he could just eat pies for, that his enthusiasm for just pies was waning. The standard breakfast of two Mr Kipling Apple Pies had reduced to just one apple pie today, but yesterday's pie delivery from top pie makers Nice Pie meant he was well equipped for lunch! For lunch Pierateer RAS would be eating two more Nice Pies, following the first two being reviewed this morning. The Red Stag Pie and Cow Pie had already been eaten last night - one of which was Pierate Highly Recommended! You can see how all their previous pies rate in our last Nice Pie review. The first Nice Pie eaten for lunch was their "Road Kill" pie - complete with tyre-track ingrained top pastry! Containing pheasant, rabbit, venison and partridge, it certainly does encompass a lot of the game meats you would enjoy out in the countryside - though I do hope they weren't actually taken from the side of the road!!! I also had another of their steak pies. These are available in many Pieminister-selling pubs and restaurants and market stalls for British Pie Week only, so get on down and reminisce about the good old times with these pies! We'll be rating them this week to add to our Pieminister Pie Reviews page! Later in the day I had a quite amazing delivery from Toppings Pies too. 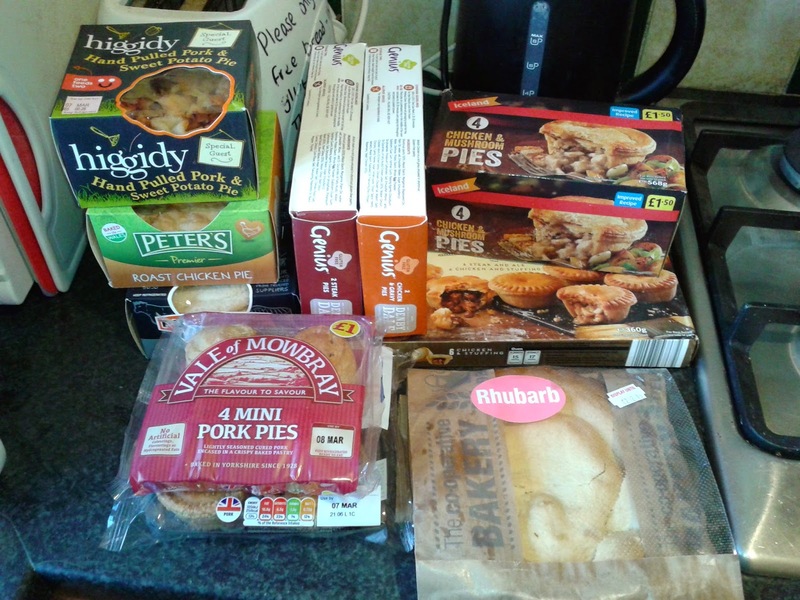 The box weighed 6kg and I could see why once I delved in and found there were no less than 25 pies, quiches and pasties! Yes - I did say quiches and pasties - not sure why they were included in the delivery, as we of course only rate pies on www.pierate.co.uk! But that will keep my housemates entertained while I focus on the vast array of pork pies and meat pies provided! During the afternoon I had a Stilton Topped Pork Pie from Toppings pies to get the ball rolling with these and sampled half a Cranberry Topped Pork Pie later that night. In between I had a chicken and mushroom pie at the Barclaycard Arena, where I am volunteering this week at the Badminton Championships. It certainly wasn't a proper pie by our definitions, but it tasted reasonably good. Day Three found Pierateer SJL a bit... hungry. He took the remaining 4 Mr Kipling Apple and Blackcurrant pies to work along with a £1 pack of 4 'Vale of Mowbray' Pork Pies. The tactic of alternating between them worked well. However, the pork pies were pretty tiny and the Mr Kipling pies were not very well filled at all. Soon all 8 of these pies were finished with no more available until the evening. Tummy rubbles could be heard across the office. Despite the name 'Vale of Mowbray' sounding like a Melton Mowbray knock off, these were decent pies, with a bit of a unique flavour too them. The evening saw SJL finally polish off the Peter's Roast Chicken pie. 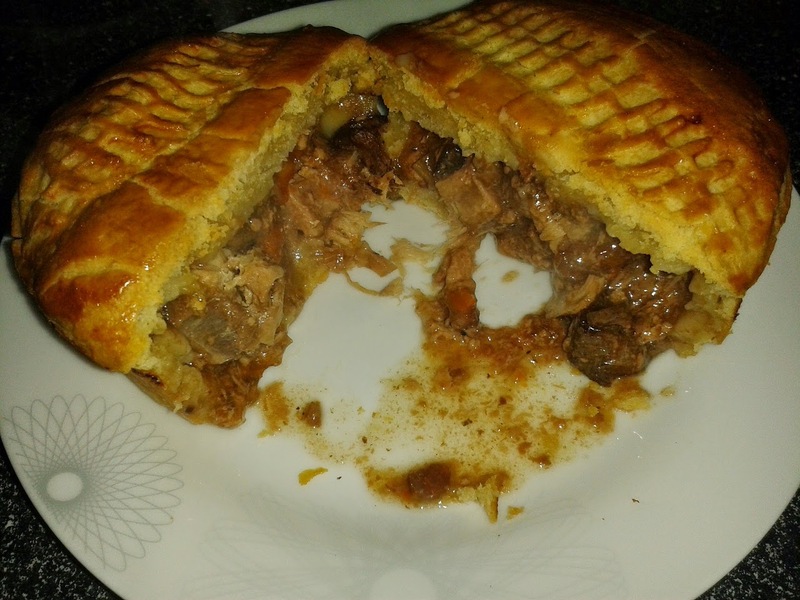 This performed well and was, surprisingly, a pie that SJL had not tried before. Given that he was just about to go out, SJL had to cook the pie and take it with him in a tupperware on the train. This is one of the ways to get around the challenges of having a hot pie on the move whilst taking part in the Pieathon challenge. SJL again delved into the box of Iceland Party pies and had 2 as a starter to the Peter's pie. Returning home late, another 2 of these Iceland Party pies were consumed to bring the total up to 13 pies for the Day! By Day Three these Iceland mini pies had become like a guest at a party who just doesn't know when they have outstayed their welcome. SJL was starting to really dislike the pastry of these pies, Is it too late to revise the review for these pies? Monday night saw Princess Victoria pub and dining room in Shepherd’s Bush welcome a wealth of talented chefs to host the Great British Pork Pie Off competition in celebration of British Pie Week. Newman Street Tavern’s Peter Weeden and his Tamworth pork pie, The Coffin, took home the judge's trophy and his winning pork pie will be sold from Selfridges’ Food Hall in central London this weekend. Alongside the judges, 60 tickets were sold to the general public – all sales donated to the charity – to see and sample pork pies from some of London’s best chefs. The public rated the pie entries and voted their favourite: the Princess Victoria’s own Matt Reuther and his individual pork, leek and bacon cold-raised pies. Well done to all involved and who supported the event!